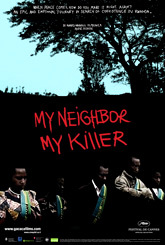 Download the My Neighbor My Killer Press Kit. Download the Gacaca, Living Together Again in Rwanda? Press Kit. Download the In Rwanda we say… The family that does not speak dies Press Kit. High resolution media is password protected. You may use our contact form to request access, or call Sharon J. Kahn at Kahn Media Strategies (212) 678-0821 with your name and press credentials.